As you may or may not know, I was raised Mormon. I’ve kind of become inactive over the past couple of years. My younger sister however, has stayed very active. She has even prepared to serve a mission. It was a bumpy road for her to prepare. She had also developed thyroid problems a couple of years ago. She was diagnosed with Graves Disease, Hashimotos, and Thyroiditis. She even had to have her thyroid removed. None of that discouraged her though and she submitted her mission papers of the summer. She got her call to Wichita, Kansas. She was very excited! She said she didn’t care where she went. She’d go wherever the Lord needed her to go. She reported to the MTC over two weeks ago on Wednesday, August 3rd. My whole family dropped her off at the airport that Tuesday. It was very hard because we are all so close. We’re going to miss her very much, but she is doing the Lord’s work and we know she will be taken care of. She went to college for a year out in Utah, but that was different. We could talk to her on the phone. Now we only get to email and write her letters. We still get a call on Christmas Day and Mother’s day. It’s going to be hard, but we’ll get through it. It’s only for a year and half. She’ll receive blessings because of it and she’s doing good things. Here’s a picture of she and I before she boarded her plane. Please excuse my hot mess hair. Here she is with my brother, sister-in-law, and nephew. My nephew was upset that he couldn’t go with Jensen. Here she is holding her mission call. Wichita, Kansas! 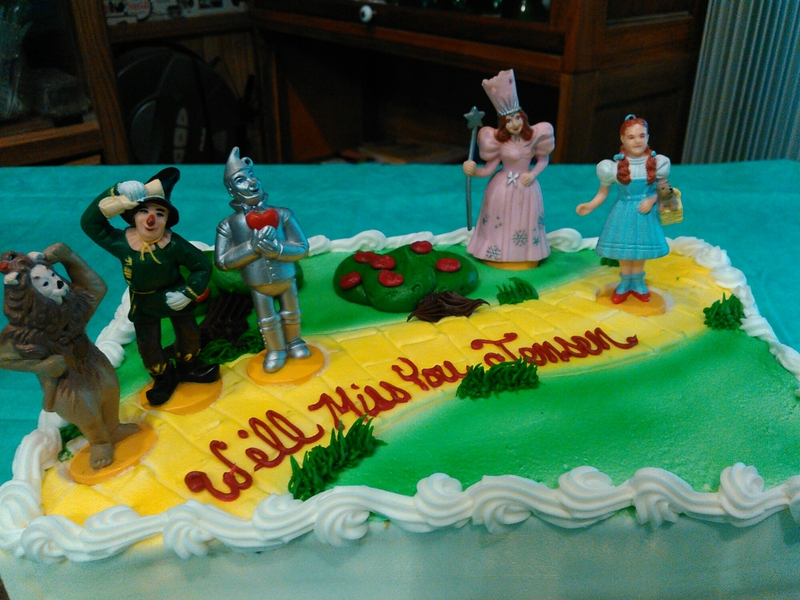 This is her Wizard of Of themed farewell cake.